but knows what he'll do if he loses. 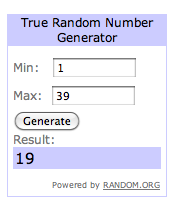 39 participants, and my Black Magic resulted in number 19 being the winner*. Antti T - you're the lucky man. You and your kids get to enjoy the benefits of the LITEMOUNTAINGEAR Cuben Stuff Sacks - congratulations! Please get in touch and let me know your address so I can send them to you. A sincere Thank You to all participants, there are some ace trips planned and I am looking forward to hear and read about them in the future. Also a big thank you to LITEMOUNTAINGEAR and the Trekking-Lite-Store.com for making this possible. If you want to lighten up your stuff sacks, remember that Trekking-Lite-Store.com stocks LITEMOUNTAINGEAR, and also the LITEMOUNTAINGEAR Webshop sells them fine cuben stuff sacks! *Comments were sorted by Oldest First, in case you went to count the comments and found a different winner.